CHARLESTON, S.C.- The Charleston RiverDogs and Fox Music have partnered once again to promote the benefits of music in the Lowcountry. The Charleston club and Fox Music paired up to donate a piano to the MUSC Health University Hospital, jointly unveiling the contribution in the main hospital lobby on Tuesday afternoon. The donation is a continuation of the RiverDogs and Fox Music's joint effort to foster the musical disciplines throughout Charleston while benefitting the club's partner in MUSC Health. Fox provided a piano played by Charleston Mayor John Tecklenburg on the RiverDogs' Opening Night in 2016 before the piece of equipment was donated to the music department of nearby Burke High School. Fox Music again provided the equipment as the Mayor tickled the ivories to open the baseball season in 2017, and will provide the Yamaha U1 vertical piano, the choice professional piano for concert pianist, professors, and venues around the world. "The ability to combine the RiverDogs Opening Night festivities with Mayor Tecklenburg and the city of Charleston, MUSC Health and one of Charleston's successful family businesses speaks volumes to the strength of our community," said President and General Manager Dave Echols. "We're thrilled to support this worthy endeavor," said Joseph Fox of Fox Music. "Our roots with MUSC Health go back to over 40 years ago when doctors from the hospital would stop by our downtown location on break to use our practice rooms as a community space to get away, and this has shaped how we view our stores to this day." "MUSC has many community partners that sometimes come together in unsuspecting ways," said Caroline O'Neal of MUSC. "Today, a few of our partners joined hands to enhance a space on our campus where many patients, families, visitors, and MUSC employees spend time - our hospital lobby. We are grateful for our relationships with the Charleston RiverDogs, Fox Music, and Doug Barnard who donated the artwork surrounding the piano for their commitment to our community and MUSC's mission." The piano was unveiled at the main hospital lobby with Charles and Joseph Fox in attendance from Fox Music along with technician Joe Marlow. 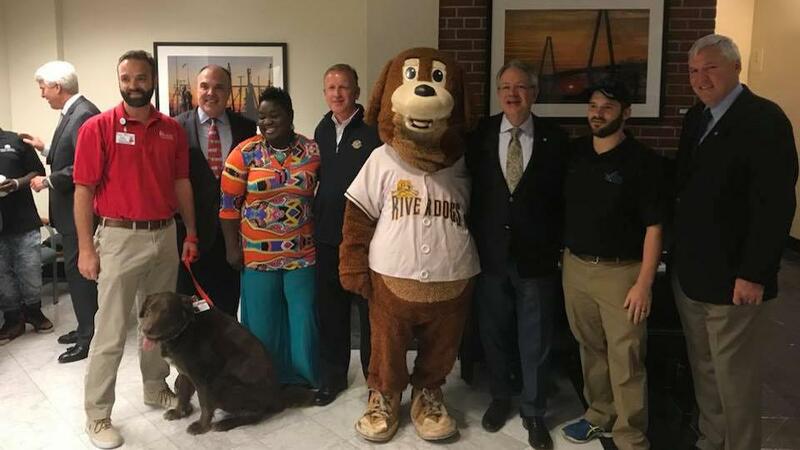 Echols and lovable mascot Charlie T. RiverDog represented the Charleston ballclub while Dr. David J. Cole, M.D., FACS, President of MUSC and Dr. Patrick J. Cawley, M.D., CEO of MUSC Health among other leadership from MUSC were present. MUSC Health, the clinical enterprise of the Medical University of South Carolina (MUSC), is dedicated to the pursuit of changing what's possible in health care. Nationally recognized for its innovation, patient- and family-centered care, and quality outcomes, this integrated health care system is accessible at the downtown Charleston campus and through more than 100 outreach locations, clinical affiliations with numerous health care partners, and a robust telehealth network. MUSC Health sees more than one million patient encounters annually, and its specialized care teams consistently rank among the best in the country. MUSC Health delivers transformational care shaped by world-class clinicians, health scientists, and educators who provide leading-edge care, while developing the next generation of innovative health care leaders. In Charleston for nearly 100 years, Fox Music continues to provide a youthful spirit with the enthusiasm, stamina, and desire to serve their customers at the highest level possible. Fox Music is dedicated to building trust and determine customer needs to provide recommendations for the most suitable music products and services. They are now serving in the fourth generations of families, and are looking forward to serving many more generations in the future. The Charleston RiverDogs, the Class A affiliate of the 27-time World Champion New York Yankees, are Charleston's leader in affordable sports entertainment. With a "Fun is Good" mentality, Charleston has impressed off the field with zany promotions and consistently are one of the top drawing teams in the South Atlantic League. The RiverDogs develop the next major league stars for the Yankees at one of the finest ballparks in Minor League Baseball, Joseph P. Riley, Jr. Park and just celebrated their 21st season in the storied venue. The RiverDogs had a record-setting year in 2017, filling the stands and having even more fun along the way, drawing more than 305,000 fans to 68 home games. RiverDogs season tickets, half-season ticket packages, and mini plans are now available for the 2018 campaign. The RiverDogs begin the season on April 12 when they host the Kannapolis Intimidators at Joseph P. Riley, Jr. Park. Ticket information can be secured by contacting the box office at (843) 577-DOGS (3647) or online at www.riverdogs.com/tickets.